All of us have heard about ERC20 tokens. If you haven’t yet, here it is: Understanding ERC20 Tokens. Also, managing ERC20 tokens like OMG or BNB is not as straightforward as Bitcoin or Ethereum. That is because ERC20 tokens don’t have their dedicated blockchain and thrive upon Ethereum’s blockchain. And that’s why it is a bit tricky to handle them. And when you are trying to manage them on a device like Ledger Nano S, it becomes even more tricky because you are required to access a third party app for this. But don’t worry, we will make this simple and help you understand how you can transfer ERC20 tokens to a Ledger Nano S for its efficient management. Note: For this tutorial, I am assuming you have your ERC20 tokens like BNB or OMG on an exchange which you want to transfer to a Ledger Nano S device. And for making this transfer, you will be required to know the ETH address of your Ledger Wallet Ethereum so that you can transfer your ERC20 tokens on it. For doing this, follow the steps given below to get your Ledger Wallet Ethereum address. Step #3. Now, connect your Ledger Nano S device to your system and put your PIN number to activate it. Step #4. Then go to your Ledger Wallet Ethereum app in the Ledger Nano S and open it. Note: Once you have opened the Ethereum app in your Ledger Nano S device, make sure your browser support is enabled. If not, go to Settings -> Browser Support, and set it to “Yes”. Step #6. After clicking the ‘Connect to Ledger Wallet’ option, you will see a screen where you need to click on ‘Unlock your wallet’ option at the bottom right as shown in the below image. 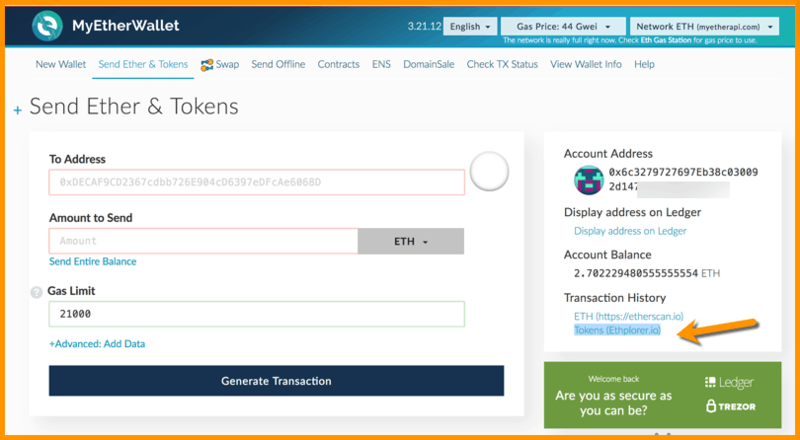 Here, you will be able to see the ETH address of your Ledger wallet where you will be required to transfer your ERC20 tokens. 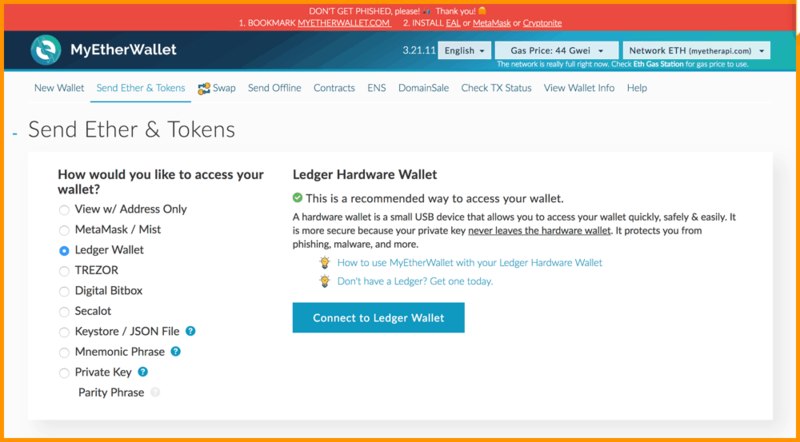 Note, this wallet is the Ledger wallet that you are accessing via MyEtherWallet. Step #8. 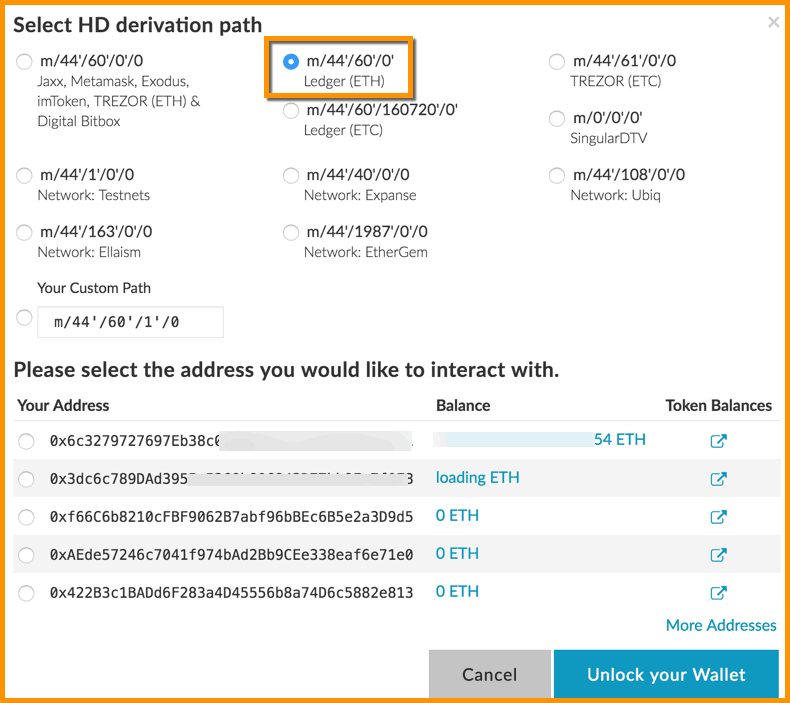 Click on ‘Display address on Ledger’ option and verify if the address shown on the screen is same as the address displayed on your Ledger device. This extra step is for avoiding ‘man-in-the-middle’ attack. Step #9. Having verified this, you can now copy this address shown on the screen on MEW interface. Step #10. Now put this address as your withdrawal address while withdrawing ERC20 tokens from a wallet or exchange. Step #11. 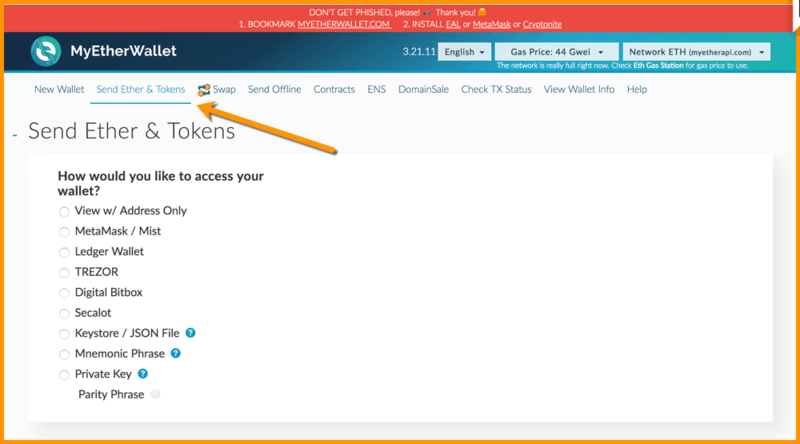 Finally, when you have sent your ERC20 token out from the exchange wallet, you can check from the below shown ‘Tokens (Ethplorer.io)’ option if you have received your tokens or not. 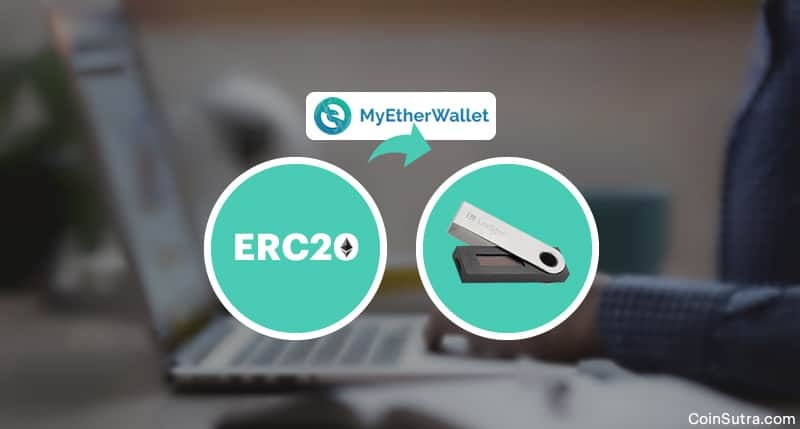 So that covers all you need to know and understand to transfer ERC20 tokens to Ledger Nano S using MEW. 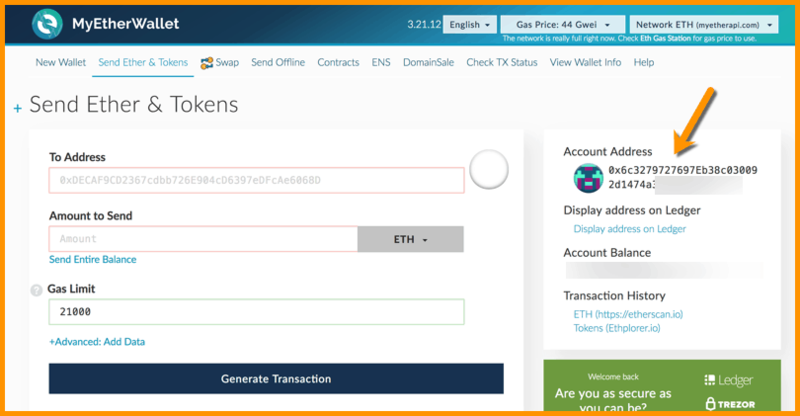 In the next article, we will talk about how to transfer ERC20 tokens from your Ledger Nano S, and that will sum up Ledger’s use for managing ERC20 tokens. If you have any questions regarding the same, feel free to ask in the comments below!